:ClrHome //alternatively, you could do "Disp "
jsTIfied doesn't replicate it exactly as I see it on my calculator, but it's pretty close. Each individual calculator will most likely display it slightly differently, but you can still get the effect on both the TI-83/84+. Also, I have tested that ClrHome looks better on the 83+, and using Disp looks better on the 84+. It could be different for everyone, however, seeing as this is kind of a **bug**. Also, background text can easily be added by using Output() or Text() before the loop starts. You can also achieve white text if you so choose. Another thing I was thinking about was making the text "vibrate", so then you could put the text in the loop and have a not(variable)->variable and have the text be at variable+N, where N represents the actual place you want to put it. The main disadvantage of this program is that if you have too many things within the loop, you lose the effect. edit 2: I accidentally wrote Xmax instead of Ymax above. whoops. EDIT: The above code should and apparently does throw an ERR:WINDOW RANGE on the CSE, or at least others' CSEs. Mine ran it fine, though. It's not animated or anything, but I thought it was cool. Why the heck did that work for you? Also, also try adding in a delay after either or both commands in the loop. 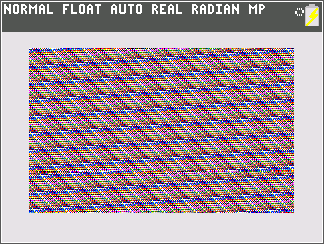 On my TI-84 Plus, it looks like paused with rand(4 for the delay after Disp. And by 'paused', I mean the weird effect thingy isn't moving but still there, it's kinda hard to explain. Using ClrHome in the loop makes the screen constantly fall downwards, and has smoother graphics and is not "blocky" at all. Using Disp (there doesn't need to be an argument) makes the screen flash instead and is more "blocky". What I mean is that each row of the home screen is blacker than the one before it, and the top left of the screen is white. So imagine a right triangle, in blocky home screen format, with each row blacker than the one before it. Note: This only does this on my calculator. I have tested it on a 84+ and the results were completely different (Disp looked better than ClrHome). Results are probably going to be different even if you have the same calculator, I'm guessing. I tested this on the TI-84 Pluses at my school. you'll get a sort of smooth static (similar to using ClrHome) with curves in it as opposed to the jagged edges of ClrHome. Note that this is on an 84+ so the results differ from those of an 83+. Ah, I see what you mean. I tested this on the 83+. It doesn't have as much of an effect though, it sort of just flashes on and off and a slower rate. I can see the grayscale curves and stuff, but because of how long ClrDraw and/or RecallPic take, it has less of an effect. Maybe it's just the 83+. Does the 84+ do it more rapidly? That looks so cool on my TI-84 Plus. It looks like a bunch of grayscale waves for me; I think it must work better on the TI-84 Pluses. Dang, I don't have a TI 84+, and jsTIfied doesn't display it like you say it does on your calculator. I guess I'll just try it on my friends calculator after spring break is over. It works on the monochrome calcs, but here's a fun fact: Trying this on the CSE will clear your RAM. ...I hope I didn't lose anything important. that still doesn't look that good on my 83+, so i'm just going to try it on my friends 84+ when spring break is over. on my 83+ it just flashes on and off at a slow speed. sure, i can see the wavy lines, but it doesn't look amazing because of how slow it flashes. This is due to the fact of how much slower the processor speed on the 83+ is compared to the 84+. Also, that's really weird that it cleared your RAM... why did it do that...? dang, this obviously still doesn't work for me. the processing speed on the 83+ isn't as fast as on the 84+. Even still, I did try this program and wright's program on my friends 84+, and it still didn't look super astonishing, but it was definitely quicker on it. the wavy lines look nice. Ooh I think I remember using the first one to a certain extent back in 2001-2002 in Illusiat 4 or Illusiat 2002. But I was using Disp intead of ClrHome. Just tried a new version, and it looks super cool (in my opinion). Again, this is still monochrome. Even though it looks similar to the first one on the page, it's not. Like always, jsTIfied can't quite capture what I see on my own calculator. Incase you're wondering, the first image is without the jsTIfied skin on, and the second one has the skin on. That's why they appear different. Anyways, this one uses 2 HEX codes to do it, which fill the screen with white pixels and fill the screen with black pixels. You can't use ClrDraw, because you won't be able to see anything. There are 267 users online: 7 members and 260 guests. © Copyright 2000-2019 Cemetech & Christopher Mitchell :: Page Execution Time: 0.409092 seconds.